Black Ice Nemesis LX240 :: ..:: Angela.pl ::..
Black Ice Nemesis LX240 PROMOCJA! 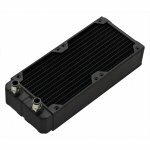 The Black Ice® Nemesis® LX240 is a light weight dual 120mm fan Xtreme form factor radiator. Dual rows and integrated Supercruise™ Optimizations provide extreme scalable performance for a broad range of fan speeds under the most demandingm conditions.